There is an item that I cannot live without in my doll room: Command hooks. I use these little guys throughout my doll room. I like the idea of hanging items temporarily (or permanently) without damaging surfaces. I use the mini decorating clips the most. As an example of how I use them, take a look at this vignette in my cabinet. See the hanging chandelier? It is made possible by the use of one of the Command decorating clips. From afar, the clip is virtually unnoticeable. This is a clean and damage-free way of hanging items in display cabinets. Here, I use one to hang the chandelier. I use them here to act as a fabric tie back on both sides, further concealed by a floral accent. I disguise the hooks by using organza ribbon. Aren’t these frames all perfect for BFMC sketches with the blue and white Silkstone-themed stripes? I found them on clearance at Target years ago. Here’s what the clip looks like when hung. This is one of the larger clips. The packaging states it can hold .5 lbs (225 g) so the weight of the frame is not too heavy at all. Lastly, I have one on the back of my door. I would never use a nail or a screw on the back of my beautiful white door! In part 1 I shared a little about how much I love to use 1:6 scale furniture and accessories to enhance the personality of a doll. I also love backdrops. I was never one to patiently learn the skill and art of photo shopping dolls into photographed scenes. I have had to rely on my own creation (or purchases) of back drops. In my doll room, the difference between a “diorama”, of which I have several, and a “vignette” is that the vignette is typically very temporary. Other than the vignettes in my cabinet & those on my display shelving, I usually set up a scene long enough to photograph it and then it is broken down and stored away. 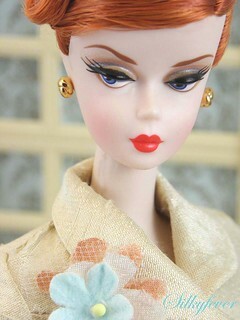 The Ingenue Barbie (a personal fave from the BFMC) paired with vintage Serie Milady vanity. 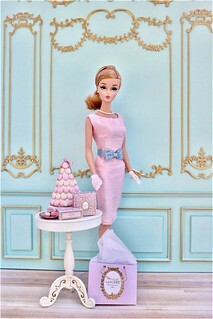 The Waitress Barbie from the BFMC Career Girls series. The scene is set in Mattel’s classic and well constructed Coca-Cola Soda Fountain. These two are a match made in heaven! In the Pink Barbie with vintage customized Suzy Goose vanity. Oh my goodness. 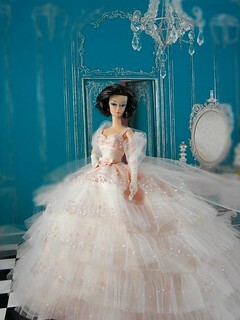 Who could not love this dress or this doll?! Highland Fling Barbie in True Brit BFMC Fashion with vintage Barbie Fashion Shop in the background. The Spa Barbies. I love this vignette even though the lighting and photo processing used at the time was horrible! But I adored the Bratz house these backdrops came from, and really wanted to incorporate them into a Barbie display in spite of the wall height issues. 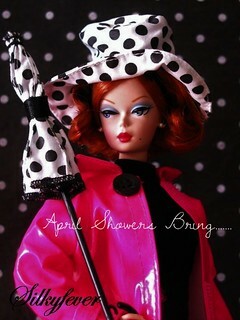 This one is minus a doll, but it was created for a series of photos I did with the Boater Silkstone doll. This was to share the contents of her steamer trunk. I have had numerous displays and backgrounds and photos over the years. The photos above are from my archives, most of which were taken YEARS ago. I look forward to new creations this year, and I look forward to sharing them here. The introduction stage is now concluded … moving on to new content in the next posts!